This story was updated at 12:17 p.m. EST. Now that NASA's space shuttle Discovery has returned to Earth for the final time, it will begin preparations for another long journey — the road to retirement and public display in a museum. Discovery landed today at Kennedy Space Center (KSC) in Florida at 11:57 a.m. EST (1657 GMT), bringing to a close both its 13-day STS-133 mission and its operational life. The next stop for Discovery — and for the two other orbiters in NASA's shuttle fleet, when they're done flying later this year — is a museum. "They call it 'down processing,'" said Allard Beutel, NASA spokesman at KSC. "It's decommissioning, really, and that process starts almost immediately." Discovery is the first of NASA's three flying space shuttles to retire, and the most prolific of the trio. It has flown the most missions (39 flights), traveled the farthest (148 million miles) and carried the most astronauts (246 crew members) during its storied 27-year spaceflight career. The space agency plans to unveil the final destinations for Discovery and its sister ships Endeavour and Atlantis on April 12 — the 30th anniversary of the shuttle program's first flight. The first few weeks following Discovery's final spaceflight will be much like the aftermath of any other shuttle mission, with technicians unloading tools and supplies, Beutel said. "You don't want a situation where, 10, 20 or 30 years from now, hazardous materials start outgassing, and tourists start passing out," said Robert Pearlman, editor of collectSPACE.com, a website for space history enthusiasts and a SPACE.com partner. Engineers will remove the thruster system inside Discovery's nose and the big engines on either side of its tail, Beutel said. Those sections will be sent to NASA's White Sands Space Harbor in New Mexico for a thorough cleaning. "That process will take months," Beutel said. When that job is done, the parts will be reattached to Discovery at KSC — though the main engines will be replicas, Beutel said. NASA will keep the original flight engines, which could be useful references in the design or testing of new equipment, Pearlman said. But most people probably won't notice the swap-out. "An average visitor to a museum won't be able to tell it's not an intact orbiter," Pearlman told SPACE.com. After Discovery is re-assembled, all that remains is a trip to its new home — presumably the Smithsonian's National Air and Space Museum in Washington. The space agency promised Discovery to the Smithsonian in 2008, but nothing is official until NASA Administrator Charlie Bolden makes an announcement on April 12. On that day — the 50th anniversary of Yuri Gagarin's historic 1961 flight (the first human spaceflight), and the 30th anniversary of the maiden space shuttle launch — the fates of Discovery, Endeavour and Atlantis will be sealed. "Charlie Bolden makes the decision, and right now he's not saying," Pearlman said. When Discovery is ready to go, it will be loaded onto the back of a 747 jumbo jet and — if the Smithsonian is indeed the destination — flown up to the Washington area. The shuttle will actually take up residence in the Stephen F. Udvar-Hazy Center, an arm of the Air and Space Museum in Chantilly, Va. It will replace the vehicle already there — the space shuttle Enterprise, a protoype that underwent some glide tests but never made it to space. What about the other shuttles? 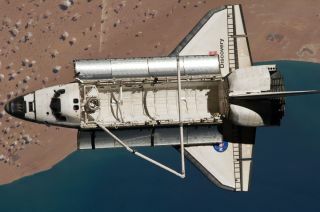 The space shuttle Endeavour is scheduled to launch April 19 on its last mission, and Atlantis' swan song will close out NASA's shuttle program in July. When they've come back down to Earth, both vehicles will become museum pieces, just like Discovery. And they'll be hotly contested, as historic and essentially intact artifacts of a proud and accomplished American spaceflight program. Counting the Smithsonian, NASA has said that 29 different museums are in the running to house Discovery, Endeavour, Atlantis and Enterprise (which will likely be up for grabs when Discovery displaces it). Assuming the Smithsonian gets Discovery, a handful of front-runners have emerged for the other three shuttles, Pearlman said. They include the visitor center at NASA's Johnson Space Center in Houston; the visitor center at KSC; the National Museum of the U.S. Air Force in Ohio; the Museum of Flight in Seattle; and the Intrepid Sea, Air & Space Museum in New York City. The Kennedy Space Center Visitor Complex's design concept for displaying a retired space shuttle orbiter. The strength of this display plan, coupled with KSC's historic association with the shuttle program — all the shuttle missions launch from KSC, and many of them land there, too — make the visitor center a good bet to snag a shuttle, according to Pearlman. Visitor center officials are confident as well. "It's hard to imagine the Kennedy Space Center not having an orbiter here to tell the story," Bill Moore, chief operating officer of the visitor center, told SPACE.com. "This truly is home." The other chief contenders all have strong cases too, Pearlman said. The Museum of Flight, for example, is near Boeing headquarters, and Boeing has played a major role in designing and manufacturing shuttle components for decades. The Seattle museum also has strong educational programs, with more than 140,000 schoolkids coming through its doors every year, according to museum officials. One important criterion NASA has laid out for potential shuttle homes is the ability to teach and inspire people. "Our education programs are really what we hang our hat on," said Mike Bush, director of marketing and public relations at the Museum of Flight. "I think we're absolutely the best place to put one of these vehicles." The Intrepid Sea, Air & Space Museum has great educational potential, too, officials at that institution said. And they pointed out some advantages of siting the shuttle in the nation's largest metropolitan area. "New York City has the greatest potential of any city in America to expose the shuttle and its story to the greatest number of people," Susan Marenoff-Zausner, president of the Intrepid Sea, Air & Space Museum, told SPACE.com in an e-mail interview. "There are 15 million people living in the N.Y. metro area, and we have almost 50 million tourists come to and through NYC every year." Despite the hefty price tag, the 29 museums will be keeping their fingers crossed, hoping for good news on April 12. "No matter what we get, I'd be doing a little dance in the parking lot," Bush told SPACE.com. You can follow SPACE.com senior writer Mike Wall on Twitter: @michaeldwall. SPACE.com Managing Editor Tariq Malik contributed to this story.